The relentless heat is occasionally punctuated by summer storms with heavy showers which relieves the pressure on plants and supports vegetation which would not survive on many other Greek Islands. In Autumn the weather becomes more turbulent and violent storms which may last several days, herald cooler weather with crystal clear skies. 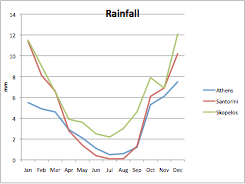 After the first rains in September There is often a period of calm with warm days and more gentle rain. During this period many of the plants, including the Aleppo pines have a growth phase before the winter brings colder weather. The bare soils become green as the grass returns plants with underground storage organs will flower or produce leaves to bloom in the winter or following spring. Most of the rain falls in winter, and as the moist ground gradually warms in spring, fresh green growth erupts from the earth. At this time the Skopelitians go out into the countryside and collect the tender shoots of a variety of plants, horta, to add interest and variety to their daily diet. March is a time of rapid change in the countryside, although the weather at this time is unpredictable by April the climate has warmed and flowers in increasing numbers are scattered across the island resulting in an explosion of colour by the end of May. Michael Carroll. Gates of the Wind. to produce a very special ecological environment. Greece has a Mediterranean climate characterised by hot, dry summers and cool, wet winters; it has long hours of sunshine and intense light with brilliant blue skies, particularly in the summer months. The Mediterranean climate is a recent development in terms of earth time, arising in its current form only 2-3 million years ago and with it developed new, specialised plant forms; it is considered to be an intermediate state between dessert and temperate climates. The Mediterranean Basin shares ecological characteristics with only four other areas of the world: Northern California, Western Chile, parts of West and South-western Australia and the Cape of S. Africa. All these areas are between 30 and 40 degrees latitude North or South of the equator on the western coast of the continents. The Mediterranean basin is sheltered by the Alpine chain to the north, from the more extreme continental weather systems of Central Europe and to the South from the intense heat of the north African desert by the Atlas Mountains. The area is strongly influenced by the North Atlantic High, the high pressure system, which bring high temperatures and little rain in summer months, but prevailing westerly winds, which bring winter rains, so important to the delicate balance of Mediterranean ecosystem. The climate is of course modified by the oceanic basin of the Mediterranean Sea itself which extends the climatic area to the east away from the Atlantic Coast. 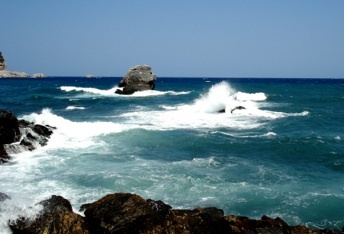 Compared to mainland Greece, the weather of the Sporades is moderated by the surrounding Aegean. 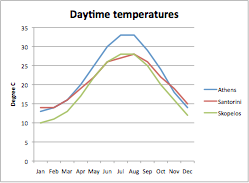 Temperatures are lower in summer than the mainland and higher in winter, though it has occasional frosts and there may be a few days of snow when it is touched by the edge of a major cold weather systems centred over continental Europe. Hot summer winds from the Sahara will occasionally raise temperature to the low forties and sometimes deposit desert sand on the islands; in contrast the islands and the surrounding sea is cooled by a tongue cooler water streaming from the Black Sea through the Dardanelles. 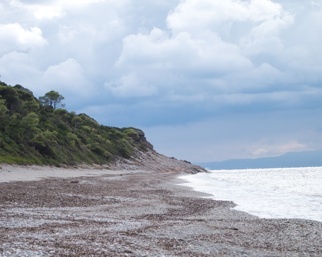 Although there is less rainfall than the Ionian Islands, west of Greece, the Sporades has more rain than Athens and the Southern Aegean Islands. Another significant influence on the weather in the vicinity is the Meltemi, the North-North East wind, notorious amongst sailors: the area is often referred to as the Gates of the Wind. 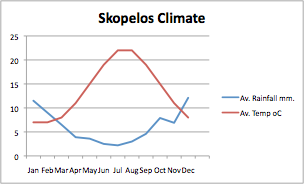 As would be expected of a Greek island, Skopelos experiences high summer temperatures with intense light and brilliant blue skies, but the Meltemi wind is active in the summer months and not only cools the island but also increases evaporation, adding to the stress on plant life in the summer months. Mediterranean plants have developed adaptations to withstand these conditions and most become dormant or are summer deciduous. 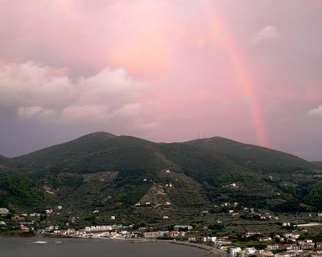 The weather in Skopelos can be unpredictable and change over short distances, with rain in Skopelos town when there is sun in Glossa , or vice versa. 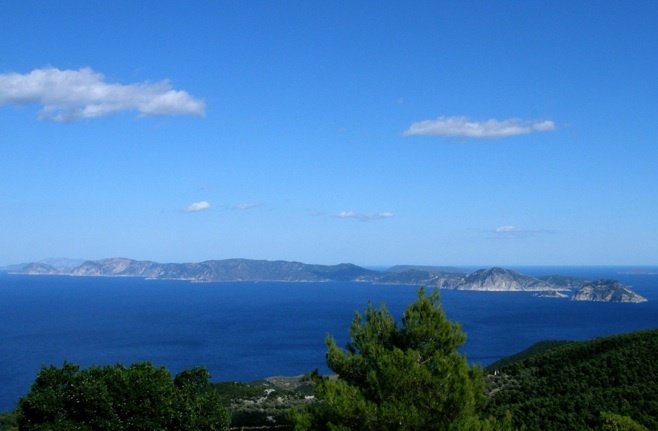 In summary, Skopelos has a complex climate which combines with local geological and anthropomorphic factors to produce a very special ecological environment. 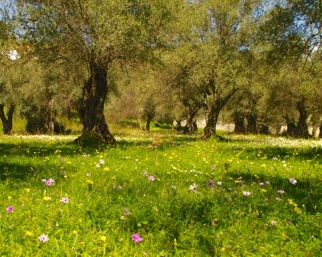 Variations even within the small area of the island creates microclimates which contributes to the diversity of plants growing there; this results in a unique flora which differs even from the flora of the other islands of the Sporades chain.